MEASUREMENTSOver All Open = 08.50 Inches,Blade Length = 04.50 InchesHandle Closed = 05.00 Inches,Han..
Red Pakka Wood, Walnut wood Bolsters Damascus Steel Blade.Over All 13 InchesBlade ..
Damascus steel, it’s a passion Stylish knives that will suit your kitchenExcellent quality Razo..
Set of Five High Quality Hand forged Damascus Steel Kitchen Knives with Ebony Wood & Kow Wood Ha..
Beautiful Damascus Steel 7 to 7.5" Hunting skinner KnifeCustom Wood Handle Hunting Skinning KnifeA C..
•	Damascus knife handmade with Excellent piece of work measures overall 8"•	Accessories Included in .. 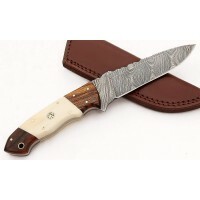 Handmade Custom Damascus Steel Skinner Bone Handle Skinning Hunting Knife with Sheath•	Stunning Hand.. Handmade Custom Damascus Steel Fixed Blade Bone Handle Hunting Knife with Sheath•	Stunning Handmade .. Handmade Custom Damascus Steel Fixed Blade Wood Handle 12 Inch Hunting Knife with Sheath•	Stunning H..
One of the best folding knives. 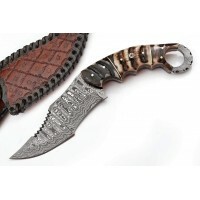 This beautiful damascus folding pocket knife comes with sheathOpen L..
High Grade Hand Forged 3Pc. Kitchen Knives Set with Damascus Steel Blade Damascus steel, it’s a..
Beautiful Damascus Steel 9" Hunting skinner KnifeCustom Bone Handle Fixed Blade Hunting Knife with s..
A wise man once said"A man without a knife is a man without a life". This is true at two levels. First of all, a knife can be essential for survival. Anyone who has been out hunting will tell you this. In fact, the knife is the invention that ascended our pre-historic ancestors to the top of the food chain. It evened our odds against creatures, nature gifted with claws and teeth superior to our own. Secondly, a knife can be the ultimate expression of uniqueness and individuality. This is true in the type of knife you choose. If you are a knife enthusiast, you will attest to this. Your preferred choice of knife resonates with something deep within you. It is as though it calls out to the very depths of your soul. And every knife has its own personality. That is why two hunters can be best friends – but their knife preferences will be remarkably different. Your choice of a knife says something about who you are. And that is why we are here. Our mission is simple: to help you find your ultimate knife. The knife which will excite your eye, warm your heart and soothe your mind. The knife which will speak out to the depths of your soul. That knife whose personality will resonate with yours. Our knives are made out of one of the coolest, enigmatic and mysterious materials ever invented by man. A material which has inspired awe, wonder and mystery for over 500 years. A material born of legend. Our knives are made out of the iconic Damascus Steel. According to one legend, Damascus steel can cut through the barrel of a rifle. Another legend claims that if a single strand of hair were to fall on the edge of a Damascus steel blade, it would be split into two. Such are the beliefs about the strength and sharpness of Damascus steel. Some even believed that the mysterious patterns on Damascus steel had the capacity to hypnotize. But we make no such claims. After all, such claims would be impossible to verify. After all, the art of creating the ancient Damascus steel is lost to history. This art and science was stumbled upon by Persian craftsmen in the 300 B.C. Throughout the middle ages, the art – which emerged in ancient Damascus –was the gold standard of weapon making. Generals all over the world salivated over the prospect of having Damascus steel swords and knives. That art –unfortunately – vanished around 1750. Modern Damascus steel emerged from experimental archaeology. Basically, people tried to reverse engineer the process used by the ancient bladesmiths. Those Persians had figured out that combining various metals would create alloys much stronger than pure steel. They thus used wootz steel ingots imported from India and Sri Lanka, combined with other steel alloys whose identities are yet to be identified to create the legendary Damascus steel. 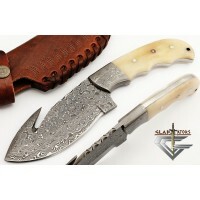 Modern approaches – which were pioneered by the bladesmith William F. Moran in 1973 – attempt to replicate the process. Damascus steel is made using a relatively common technique called pattern-welding. This technique involves forging a blade from welding together several differing pieces of a metal. Moran used this technique to produce the first knives which he called "Damascus knives" back in 1973. Since then, pattern-welding has been used to produce Damascus steel – partly because it produces the beautiful patterns which characterize Damascus steel surfaces. Modern Damascus steel is constructed from different types of steel welded together to form a billet. The steel is typically combined with strips of iron to provide core strength at molecular level. The combination of steel and iron gives the blades both ductile and brittle. The word "brittle" in this context means that the blades are flexible enough to bend without shattering, breaking or getting deformed. The combination of flexibility and strength is part of the allure of Damascus steel. The process of making Damascus steel is quite straightforward: steel ingots andiron strips are welded to form a billet. This billet is continuously folded within other metal types (sort of like sandwiches). The folding process is continued until the right number of layers is attained. The layers differ according to the density required by the bladesmith. 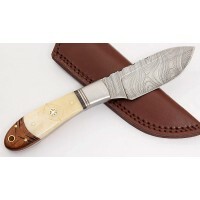 The American Bladesmith Society recommends that a Damascus blade is made with a minimum of 300 layers. Once the blademsith's preferred number of layers is attained, then the shaping begins. The billets are then hammered and shaped according to the type of knife that the smith is making. This is then followed by the finishing. That is the process in a nutshell. Throughout the process, the steel is typically heated to temperatures of between 1500F and 2000F. Right from the ancient times, Damascus steel has always been made by hand. This is because making it has always been considered an art form. Bladesmiths who make this kind of steel hone their skills over time. And they take great pride in their artistry. In fact, the secrecy around making Damascus steel is partly the reason why the skill disappeared from history. Today, the process isn't as secretive. However, the hand-crafting element still exists. Most Damascus steel is hand-crafted. This is true especially for the knives. It is certainly true for the knives that we have in our collection. 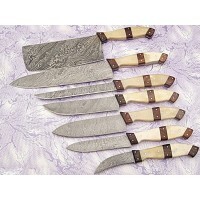 Our forte is hand forged Damascus steel knives. The beauty of hand crafted knives is that no two of them are alike. Even if they are made by the same bladesmith – following the same approach, each is unique. And each of them bears a personal touch of the smith. It is warm and personal. It is as though the smith leaves a part of himself to the knife. This is what makes these knives special. They have an aura which mass-manufactured knives can never have. 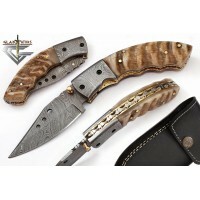 Therefore, if you are a true knife enthusiast, you need to get one of our hand forged Damascus steel knives. Whether you are a hunter, adventurer, explorer,outdoors person or collector, you will find something special in these knives. And you will be glad you bought one. Damascus steel knives have been sought after for over 1000 years. This is because these knives are so versatile. They are durable, strong, rugged and almost brutish. But they are also sharp, flexible, sweet and simply cute. And the sheer variety of designs which come on the blades make them an item of beauty. In a nutshell, these knives have the perfect blend between functionality and aesthetics. These knives are mostly built for the outdoors. 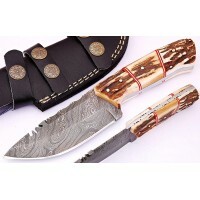 Therefore, whether you are out hunting, camping or even hiking, a Damascus steel knife can come in handy. 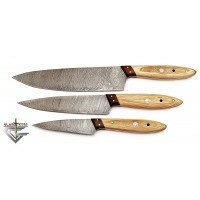 You can use them for skinning an animal, cleaning fish, cutting food (when cooking)or even slicing fruits for a salad. These knives can also come in handy when sharpening stakes for pitching up your tent. And in situations when you need to defend yourself against a while animal, a Damascus steel knife can come in handy. Basically, the sheer versatility of these knives make them a must-have for anyone who enjoys the outdoors. The combination of strength and flexibility makes these knives invaluable. You can find over 100 uses for these knives. Aside from their functionality, Damascus steel knives make for great collector's items. 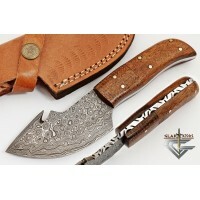 This isn't just because of the legend and lore surrounding Damascus steel. And there are lots of those out there. The fact that this art form has existed for over 1,000 years. That is a great story in and of itself.If you are a Game of Thrones fan, this will excite you: the fabled Valyrian steel seems to have been inspired by Damascus steel. Folklore aside, Damascus steel knives are spectacularly beautiful. The intricate patterns on the blades of these knives make them extremely decorative. 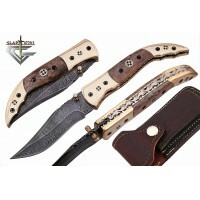 You will not find any other type of knife with the magnitude of designs available in Damascus steel. The sheer beauty of some designs is simply breathtaking. As such, if you are someone who appreciates the finer things of life, you definitely will do with some Damascus steel knives in your collection. Despite being strong and durable, Damascus steel has one major weakness: it is prone to rusting. This arises from two factors. First of all, Damascus steel is rarely made from stainless steel. Most blades are made from high carbon steel.This steel is prone to rust. 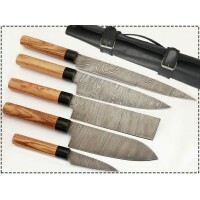 Secondly, the seductive designs on Damascus steel blades are often etched with acid. This makes them prone to discoloration. 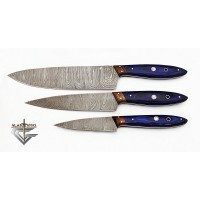 To maintain the integrity of your Damascus steel knives you need to take good care of them. Thankfully, the care for these knives isn't at all complicated.All of them center around keeping the knives away from situations which can cause the blades to rust. Here are some nice tips. 1. You need to keep the knife dry at all times. As soon as you finish using the knife (e.g. for cutting up fruit or skinning an animal), you need to dry the knife thoroughly. Any droplet of water left on the blade can cause rusting. Pay special attention to the handle as well. Make sure it too is dry. Sometimes,residual water droplets from the knife's handle can seep towards the blade.This can lead to rust. 2. Store the knife in a dry place. The reason for this is similar to the one above. Don't place the knife in a moist place because it will rust. 3. Do not leave the knife in a leather sheath for prolonged periods. Leather sheaths are a standard way for storing knives. This is because leather is naturally absorbent. It can absorb moisture and cause the knife to rust. We recommend coating the knife's blade with light oil or Vaseline before putting it in the leather sheath. Alternatively, you can wrap the blade up in a plastic wrap. The Vaseline and plastic wrap will protect the blade from getting damaged. 4. In case the knife begins developing rust or corrosion, you should wet sand the blade using WD40 and 1500 wet or dry sandpaper (or 000 steel wool). The WD40 will act as a cutting agent. The sanding should be light and non-aggressive. This will help restore the blade to its original state. If you sand aggressively, you can end up messing up the intricate designs on the blade. In a nutshell, those are some tips you can use to protect your Damascus steel blade. The bottom line is to keep the knife dry at all times. You should especially be careful when you using the knife in wet or humid environments.You should also note that acidic foods (like citrus fruits) can cause the etchings on the blades to get distorted or even fade. As such, immediately after using the knife, you should wash it, dry it thoroughly and store it. Our ultimate goal is to simplify your shopping experience. This is because we want you to acquire the perfect hunting knife for your needs without a hustle.As such, we have created a payment system which is simple, secure and super-fast. All the payments are processed through PayPal. Each transaction is handled with utmost discretion and professionalism. And, of course, your security is paramount. As such, we employ the latest security features to protect your personal information. Each transaction is protected by layers of encryption. You can therefore rest assured that your shopping will be 100% secure. However,the increased security doesn't mean that you will incur lots of complexity. Oh no! Shopping with us is extremely easy. You simply enter your PayPal email, and our system will walk you through the entire process. And of course, in case you need help, our customer support team is always on hand to assist you. So, get shopping already. Go find that Damascus steel knife that you've been secretly longing for. 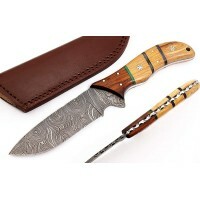 In our exhaustive collection of custom Damascus knife choices, you will certainly find your heart's desire. You will find the one knife which speaks to your very soul. And that is the point when you will understand the magic of the Damascus steel knife. That is the point when you will truly come alive.